The student experience has changed dramatically over the past few years. Today, the tools used for teaching and learning have evolved from textbooks and bulky desktop computers to slim and highly portable devices. As a result, the upsurge of mobile learning on school wireless networks is far from surprising as today’s tech-savvy students prefer to learn with mobile devices. This is the primary driver of the bring-your-own-device (BYOD) phenomenon where both students and educators can bring their own mobile devices to school to engage in an enhanced learning experience. While there are huge benefits to embracing a highly interactive curriculum that’s supported by mobile devices, it also places a whole new set of pressures on school WLANs. The biggest of these is network security which can quickly become complicated as a result of multiple endpoints on the network. So what can IT network administrators and school superintendents do to keep their networks secure? Let’s take a look. The biggest risk from BYOD initiatives will come from not regulating how students, teachers, employees, and administrators utilize their personal devices. As a result, academic institutions must first establish policies and guidelines that are based on the functions of approved applications. This can be done by determining what does and does not qualify as accepted use. Once agreed, it should also be clearly defined to all stakeholders. For example, you can let them know that web access to social media and adult content is strictly prohibited and restricted, even from a personal mobile device. Once you have established and employed a set of guidelines and policies, you also have to enforce them. As a result, schools should also conduct regular simple security checks by taking advantage of data analytics. Identifying and implementing an authentication and encryption strategy that is user-friendly, will enhance your network security. For example, using a solution like 802.1x authentication with WPA2-AES encryption will go a long way in keeping your school network secure. You can also set it to use machine authentication or user authentication to control the level of access students have to the network. Furthermore, MAC authentication and certificates can also be incorporated into the mix of differing levels of security. Role-Based Access Control (RBAC) enables the IT team to assign a role to the device strictly based on how it was authenticated. This means that if the mobile device was authenticated with machine and user data, it will be assigned a role like a teacher or a student. What’s more, if the device is only authenticated based on the user’s credentials, then it will be assigned a different role that can limit access. Once the role of the device is clearly defined, then access rules can be applied to it. It will be impossible to install software firewalls on all the personal mobile devices that connect to the network. As a result, implementing a Session Border Controller or a hardware firewall are great options to lock down the entire network. If the school is utilizing a firewall as the first and second line of defense, it can also be easily configured with a VPN. This approach combined with antivirus solutions is one of the best ways to prevent DDoS attacks. 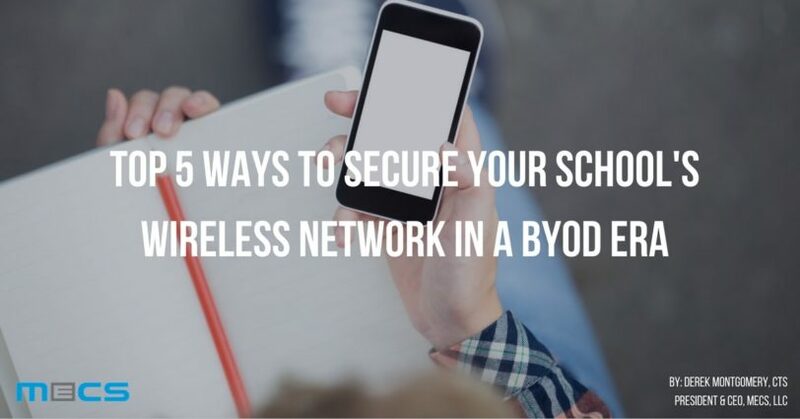 The above will optimize your school’s wireless security, but the IT department can quickly get overwhelmed with requests to configure students’ devices. That’s why it’s important to implement an auto-enrollment component. This means that students and teachers will be able to connect to the campus SSID with their personal devices and log on by using their user credentials. In this scenario, the system will configure the device, register it to the individual user and move it onto an appropriate role that’s based on the BYOD policy. To learn more about how you can secure your school’s wireless network, click HERE to schedule a consultation with MECS.